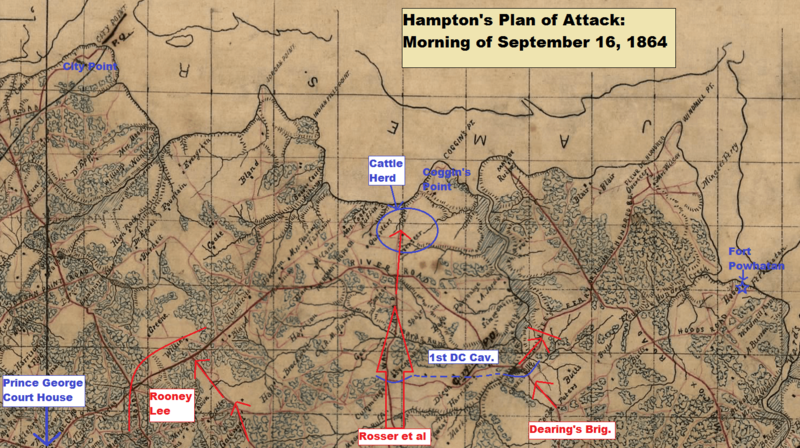 Brief Summary: In the early morning hours of September 16, 1864, two of Hampton’s three wings of Confederate cavalry planned to slam into the 1st District of Columbia Cavalry at Sycamore Church and Cocke’s Mill. Their goal was the large Union cattle herd at Coggin’s Point, currently grazing on the grass and clover of fire eater Edmund Ruffin’s plantation. In the darkness, George Shadburne, the scout from the Jeff Davis Legion who had originally reported on the cattle to Hampton back on September 5, proposed a plan to quietly use a ravine to swing around the Union camp at Sycamore Church and capture the 1st DC Cavalry in their beds. Tom Rosser had other ideas. He convinced Hampton to let him charge straight into the Union camp and surprise them before they could offer any resistance. One squadron from the 11th Virginia Cavalry led the way, but they drew fire from the Union picket on the road and had some trouble with the reserve picket line. Eventually, weight of numbers and the advantage of surprise won the day, and Rosser’s men bagged Major J. Stannard Baker from the 1st DC Cavalry as well as many men from the two battalions he led at Sycamore Church. Rosser’s attack was heard by the right and left wings, letting them know it was time to play their roles as well. Dearing’s men on the right overwhelmed the remaining battalion of the 1st DC Cavalry at Cocke’s Mill, taking up a blocking position against Fort Powhatan to the northeast. These Union troopers retired in the direction of what they thought was safety at Sycamore Church, not knowing Baker’s men had already been overwhelmed. They too were captured. On the left, Rooney Lee’s division moved to the intersection of Lawyer Road and the Stage Road near Wilkin’s farm and, after a short recon mission toward Prince George Court House, they dug in. 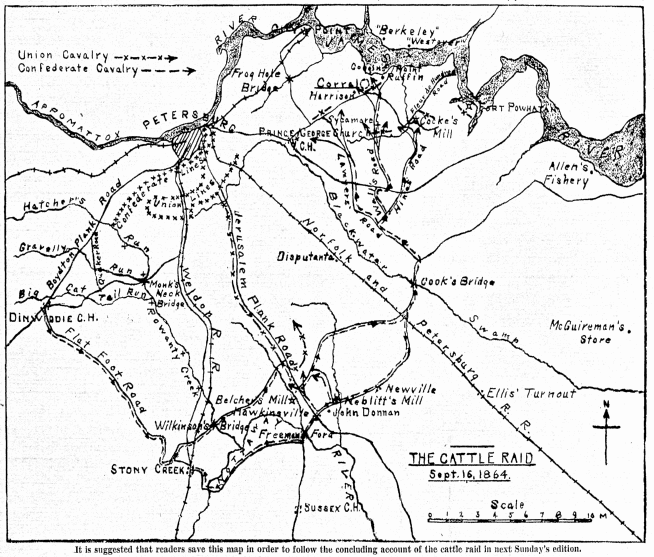 Their mission was to block any Union advance coming from the direction of the main Union lines to the west or the Union supply base at City Point to the northwest. This left one more item on the agenda, the capture of the cattle by Rosser’s Brigade and a picked group of one hundred men from Butler’s Division. Facing them were less than one hundred civilian herders and a portion of the 13th Pennsylvania Cavalry under Capt. Henry Gregg, the brother of cavalry division commander David McM. Gregg. After the Federals refused to surrender, White’s 35th Virginia Battalion scattered Gregg’s men quickly, at which point Rosser’s men rounded up the cattle and headed back toward Sycamore Church. At this point the raid changed to a race for the Confederate lines, at least as far as cavalry can “race” when burdened with almost 2,500 cattle. Hampton sent couriers to his right and left wings to recall them to Sycamore Church. Rosser and the cattle would head out first, followed by Dearing, with Rooney Lee’s Division bringing up the rear and attempting to hold off any Union incursions. The Union cavalry started out on a two pronged pursuit. Kautz led the 3rd New York Cavalry back to Sycamore Church, but the Confederates were long gone. In addition, the 2nd Cavalry Division of the Army of the Potomac, temporarily under the command of General Henry Davies, pursued down the Jerusalem Plank Road, just as Robert E. Lee had predicted when Hampton brought the idea of the raid to his attention. 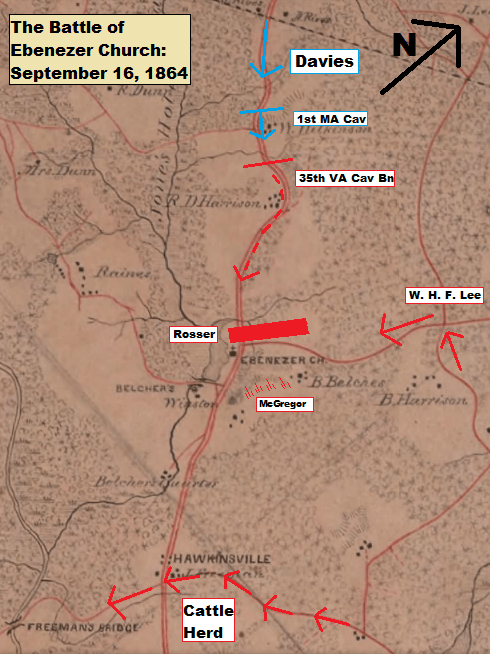 As the cattle continued towards the Blackwater and Nottoway rivers, Rosser’s Brigade threw up a blocking position near Ebenezer Church on the Jerusalem Plank Road on the afternoon of September 16. Davies struck this position in an attempt to get to the cattle, but after several attacks he called things off. Hampton tried to surround Davies, but he had already withdrawn north several miles. One last abortive attempt to find the cattle by Davies’ men south of Reams’ Station to the east was attempted. Davies called off the pursuit for good after this. Hampton, meanwhile, continued on to the south and west, eventually camping just west of Wilkinon’s Bridge over Rowanty Creek, the same spot the Confederates had spent the night of September 14. The cattle spent the night of September 16 just west of Freeman’s Ford over the Nottoway River south of Ebenezer Church. After multiple skirmishes and the successful rustling of the cattle on September 16, all that was left for the Confederates on September 17 was to make the final portion of the trek back to Confederate lines. Up the Boydton Plank Road. Would they make it…. ?